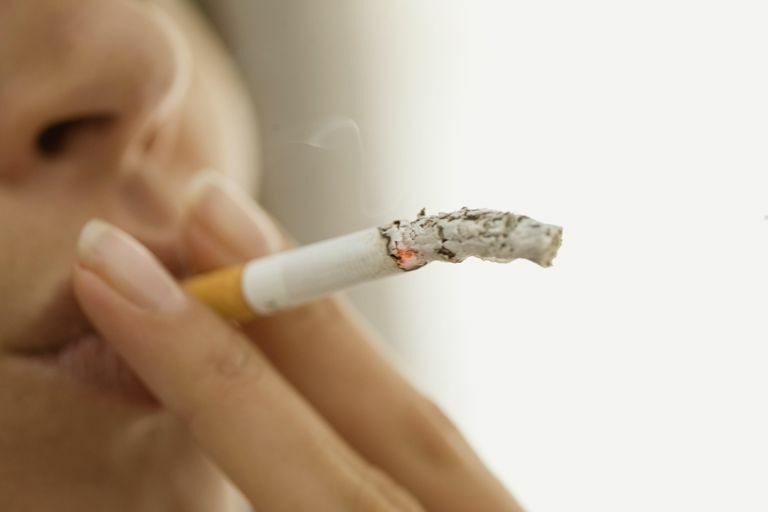 Research has shown that there is a connection between nicotine and inflammatory bowel disease (IBD). However, what is puzzling is that smoking seems to have opposite effects on the two main forms of IBD—ulcerative colitis and Crohn's disease. Ulcerative colitis is largely referred to as a disease of non-smokers. Former smokers are at the highest risk for developing ulcerative colitis, while current smokers have the least risk. This tendency indicates that smoking cigarettes may prevent the onset of ulcerative colitis. Researchers have discovered that it is the nicotine in tobacco cigarettes that have a positive influence on symptoms of ulcerative colitis. Nicotine is a naturally occurring substance in tobacco that has a complex effect on many organs and systems in the body. Nicotine is also highly addictive, and many people who smoke cigarettes have difficulty quitting despite serious health risks. It is theorized that the nicotine in cigarettes affects the smooth muscle inside the colon. This effect may alter gut motility (the rate at which food material moves through the GI tract). Smoking cigarettes actually has a detrimental effect on Crohn's disease. People who smoke, or who have smoked in the past, have a higher risk of developing Crohn's disease than non-smokers. Crohn's disease patients that smoke have an increased number of relapses and repeat surgeries and may require aggressive immunosuppressive treatment. People with Crohn's disease are strongly encouraged by their physicians to stop smoking in order to prevent flare-ups of the disease. Secondhand smoke in children does have an effect on the course of IBD. Children exposed to secondhand smoke have a decreased risk of ulcerative colitis and an increased risk of developing Crohn's disease. Should Former Smokers with Ulcerative Colitis Light Up Again? Some studies have shown that former smokers who develop ulcerative colitis and then go back to smoking experience fewer symptoms. However, smoking itself carries other serious health risks. Physicians would not advise that a patient start smoking, as the risks of smoking far outweigh any possible benefit. Now that nicotine patches (also known as transdermal nicotine) are available for smoking cessation, it is possible to study the effects of nicotine alone without exposing the body to the other health risks of smoking. The effect of a drug is often studied by researchers in a type of experiment known as a double-blind placebo-controlled study. In this type of study, some patients are given the new drug while others are given a dummy preparation (placebo). Neither the patients nor the physicians studying them know who is receiving the actual drug and who is receiving the placebo until the study is completed. In two double-blind placebo-controlled studies, nicotine patches were found to be better than placebo at inducing remission in active ulcerative colitis. Unfortunately, side effects in the nicotine group were common and included nausea, lightheadedness, and headache. Study participants who had never smoked found the side effects particularly bothersome. In another study, people with left-sided ulcerative colitis who were no longer responding to treatment with oral mesalamine were given transdermal nicotine and mesalamine enemas. This new combination was effective in inducing remission in 12 of the 15 study participants. Nicotine does not appear to be beneficial as a maintenance therapy; it may not help patients stay in remission. Rather, it seems to have a positive effect on active disease (flare-ups). To prevent the side effects from the patch, researchers are developing ways to release nicotine directly to the colon. In one study, a nicotine capsule was created to act directly on the colon over a period of 6 hours. What Does This All Mean for People With Ulcerative Colitis? The total effect of nicotine on ulcerative colitis is still unclear, but it does present a promising direction for the development of new treatments. As nicotine's role in the colon is better understood, patients with ulcerative colitis may someday benefit from new treatments based on this effect. Green JT, Evans BK, Rhodes J, et al. "An oral formulation of nicotine for release and absorption in the colon: its development and pharmacokinetics." Br J Clin Pharmacol October 1999;48:485-493. 28 May 2009. Mahid SS, Minor KS, Stromberg AJ, Galandiuk S. "Active and passive smoking in childhood is related to the development of inflammatory bowel disease." Inflamm Bowel Dis Apr 2007 13;431-438. 28 May 2009. Pullan RD, Rhodes J, Ganesh S, et al. "Transdermal nicotine for active ulcerative colitis." N Engl J Med Mar 1994;330:811-815. 28 May 2009. Sandborn WJ, Tremaine WJ, Offord KP, et al. Transdermal nicotine for mildly to moderately active ulcerative colitis. "A randomized, double-blind, placebo-controlled trial." Ann Intern Med Mar 1997;126:364-371. 28 May 2009. Sandler RS, Sandler DP, McDonnell CW, Wurzelmann JI. "Childhood exposure to environmental tobacco smoke and the risk of ulcerative colitis." Am J Epidemiol Mar 1992;135:603-608. 28 May 2009.